At The Architect’s Newspaper, we’re plain addicted to Instagram. Sure, we love seeing Brutalist concrete through “Inkwell” or “Ludwig” filters, but there’s also no better place to see where architects are getting their inspiration, how they’re documenting the built environment, and where they’ve traveled of late. Below, we bring you some of the best Instagrams of this past week! (Also, don’t forget to check out our Instagram account here.) 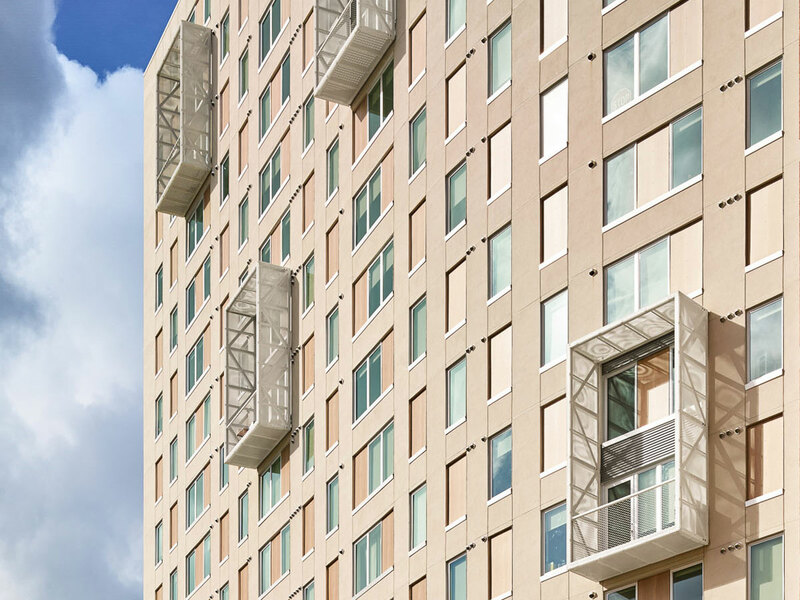 Today, the modular design-build company Cover revealed its first unit designed, manufactured, and installed in L.A. The backyard studio is kind of a tiny home and definitely modernist, a fusion of two design trends that define the internet. Today we reveal the first Cover unit built in our Los Angeles factory and installed in a client’s backyard. It’s a 320 sq. ft. backyard music studio and office situated in the hills of Los Angeles. 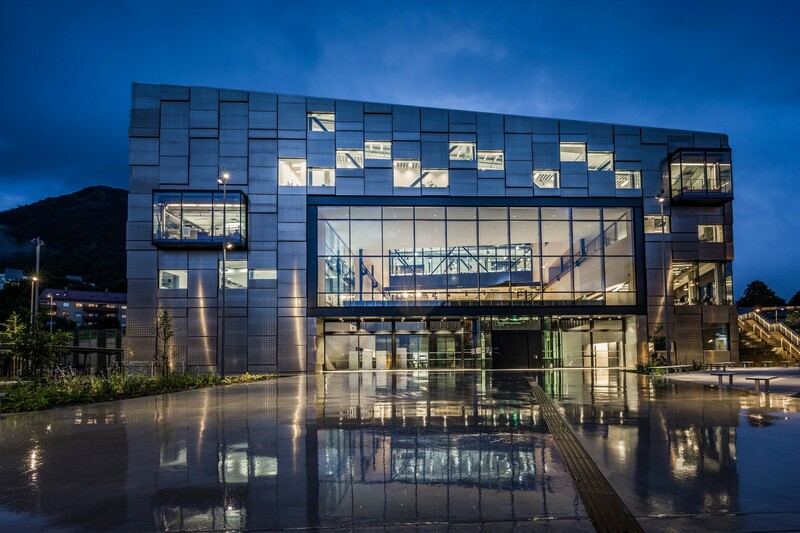 Out in Norway, Snøhetta has designed a new building for the Faculty of Fine Art, Music and Design (UiB) at Bergen with a glimmering metal cassette facade that changes with the light. It's all flash, in a good way. While Snøhetta's newest project sparkles from the outside, Foster + Partners is looking deep within the body for architectural inspiration. 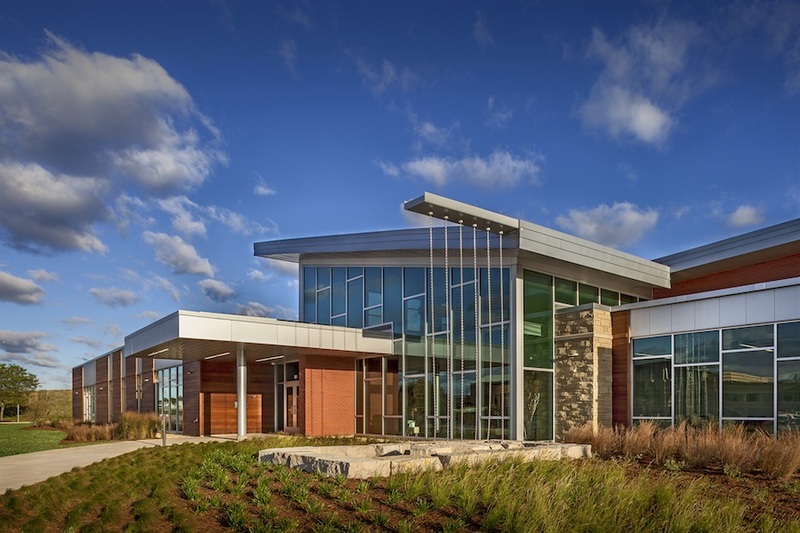 The firm has partnered with a PhD candidate at the Royal Veterinary College, London, to "study the relationship between structure and function in bone biology and architectural design at various scales." To achieve this, Foster + Partners developed a Grasshopper plugin that helps designers create 3D space frames within almost any shape. Despite all the talk that digital technologies have killed architectural drawing, there are still many designers who love to render spaces by hand (with a computer assist). 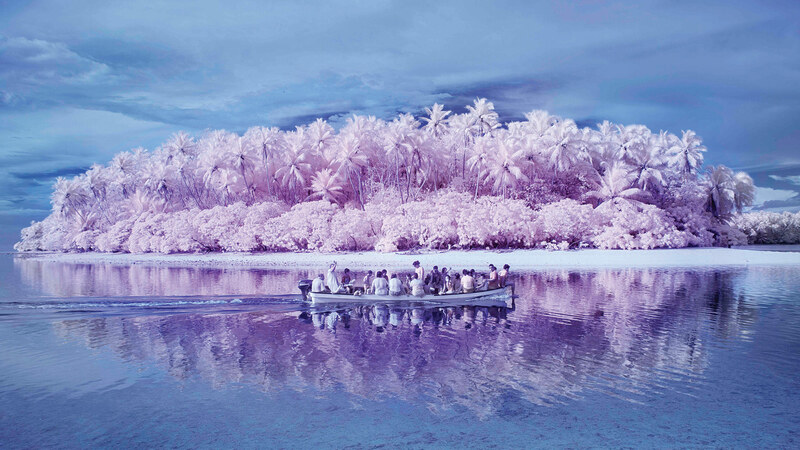 KoozA/rch just featured Challenging The Threshold Between Image and Space, a eerily calming pastel computer collage by architect Sven Jansse, founder of Rotterdam's Image & Space, in collaboration with Alexandra Sonnemans. Challenging The Threshold Between Image and Space by Sven Jansse in collaboration with Alexandra Sonnemans#art #artitecture #architecture #koozarch To what extent do you agree with the medium is the message – how does the use of collage reinforce the concept behind fragments? Probably the most fundamental concept behind the current work done by Image & Space, is that each visualisation should be able to generate its own value, independently of what they (appear to) represent. They are designed to tell their own story, establish a new truth and present it to the audience to evaluate. The medium is thus even more than the message; the visualisations become the project. They are no longer bound by the physical or economical limits of what they have to make understandable or try to sell, and by presenting the images without their expected context of drawings or a presentation, the spectator gains the freedom to interpret them in a very personal way. In order to stimulate people’s imagination, it’s important that one visualisation never shows the whole building, because it’s up to the audience to connect the different ‘fragments’. In this way, each visitor will ‘build’ a different building, and curate their own spatial experience. In meatspace, there's nothing better than plonking yourself down onto a thick carpet. For a lecture hall at Taipei's Jut Foundation for Arts and Architecture, MVRDV teamed up with Argentine rug maker Alexandra Kehayoglou to create a verdant greenscape that covers the stepped floors, creeps up the walls, and conceals an exit door. Like Paris' Eiffel Tower, the London Eye was only meant to be a temporary structure. However, 17 years after its opening in March 2000, after it had been dramatically hoisted up into place after hanging over the River Thames and unveiled as the "Millennium Wheel," the structure is now an indelible icon on London's skyline. Designed by Marks Barfield Architects, the Eye has now outlived one of its creators, David Marks, who passed away on October 6 at the age of 64. According to his firm, Marks had been ill for sometime. Born in Stockholm, Sweden, Marks grew up in Geneva, Switzerland before moving to London to study at the Architectural Association School (AA) in 1972. There, he met another student, Julia Barfield, who he married in 1981. The couple went on to form Marks Barfield Architects in 1989 and together they have contributed some of the U.K.'s best elevated views over the past two decades. The 1990s was a somewhat bombastic time for London architecture. The impending millennium gave rise to Britain's architectural heavyweights—though not quite household names at the time—to design monuments for the occasion: Richard Rogers, who once employed a young David Marks, provided the Millennium Dome (now the O2 Arena) and Norman Foster the Millennium Bridge. Both structures were swiftly derided after their opening. The Dome was costing the government $42 million a year and couldn't be sold, while Foster's bridge, nicknamed the "Wobbly Bridge" was in fact so wobbly in the wind that it had to be temporarily closed down and fixed. One other millennium-based addition to London's skyline, however, endured no such tumult. As you might have guessed, this is the London Eye. David Marks and Julia Barfield's design dates back to 1993 when it was submitted to a competition organized by the Sunday Times newspaper and The Architecture Foundation which called for a millennium landmark. The Millennium Wheel, along with every other submission, was rejected. Undeterred, Marks and Barfield remained intent on spinning the wheel into motion. Their efforts paid off when the Evening Standard told the story of the wheel's plight and just over a year later, British Airways contacted the firm about getting the project underway. 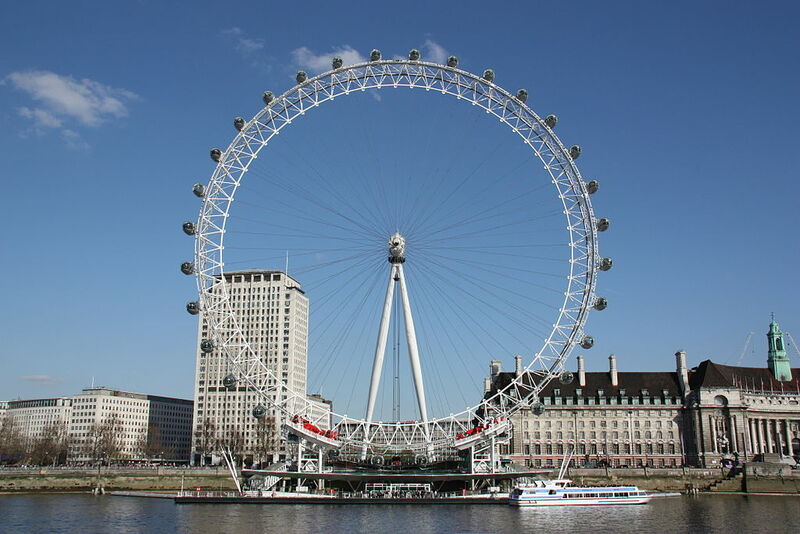 Now, the London Eye is the U.K.'s most popular paid-for attraction with approximately 15,000 daily visitors embarking on the 1,392-foot-journey around the Eye's circumference at a steady 0.6 miles-per-hour. 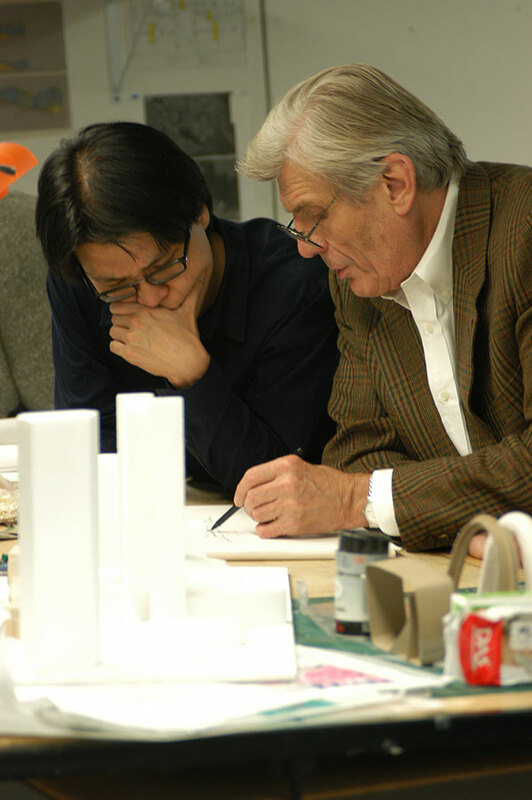 At the turn of the millennium, David Marks was awarded an MBE and a Special Commendation for Outstanding Achievement in Design for Business and Society by the Prince Philip Designers Prize. Marks Barfield's partnership with British Airways has born other fruit too. The firm's most recently completed work, the i360 in Brighton, is a rotating observation tower that rises to 531 feet along the South Coast. Opened in 2016, the structure lifts and revolves a pod, reminiscent of the London Eye's 32 pods, up and around a pole. Another elevated viewing platform the firm provided is the Kew Gardens Treetop walkway. Situated 60 feet above ground, the 650-foot-long path made from weathered steel looks over some of the world's best horticulture. The project was completed in 2008. Last year, the firm collaborated with New York studio, Davis Brody Bond, to propose a gondola system for Chicago. https://vimeo.com/165363195 Currently, Marks Barfield Architects is working on a new Mosque in Cambridge with Keith Critchlow, a professor of architecture at Cambridge University who taught David Marks at the AA. Due for completion in 2018, the project will accommodate up to 1,000 men and women. Bright colors, bold stripes, and geometric shapes were found in abundance during London Design Festival (LDF), which closed on September 24. Stealing the show were London designers Camille Walala and Adam Nathaniel Furman. The former’s Villa Walala inflatable castle comprised a series of basic shapes doused with playful colors to match. Walala’s installation, which is in keeping with her previous work, couldn’t be more out of place. 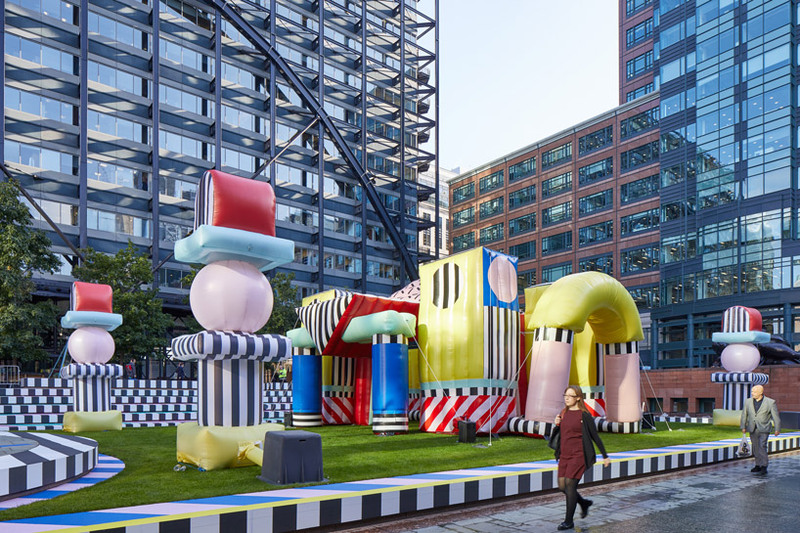 Situated in Broadgate’s Exchange Square by Liverpool Street, Villa Walala spruced up an area typically awash with navy-suited bankers on smart phones. The castle was perhaps much needed. The splash of color continued on to the West. At the Barbican, Morag Myerscough and Luke Morgan designed Joy. Spanning the Barbican’s concrete wall along Silk Street were six symbols: a heart represented love, a globe represented society, a sun represented joy, an eye represented London’s openness, a star represented energy, and finally, a flower represented peace. The same symbols could also be found at the designers’ Peace Garden and Pavilion in the West Smithfield Rotunda Garden. This piece, which was more accomplished, played with perspective and also provided shelter to visitors courtesy of drapes partially spanning the circular walkway, supported by zig-zagging columns. More of Myerscough’s work could be found south of the river, too, though this was not part of the LDF. Emblazoned onto Grosvenor Arch, the entrance to Battersea’s Circus West Village (an area primed for vapid commercialization and luxury condos), is the word “POWER.” Just as blindingly colorful as the Peace Garden and Pavilion, the piece – known as Power Circus – makes use of marine plywood panels that were hand-painted by Myserscough and her team of artists. If this aesthetic was to your taste, then one could head even further west to White City. Here, New York and London-based designers Craig Redman and Karl Maier transformed a former gas station. Titled HereAfter, the colorful installation was not part of the LDF but is open to the public indefinitely. HereAfter can be found on 74 Wood Lane. It should be no surprise that with such vibrant hues being plastered all over the capital, Adam Nathaniel Furman got in on the act. Another star installation which had Instagrammers flocking to it was Gateways. Commissioned by Turkishceramics, Furman designed four 13-foot-by-13-foot tiled gates that referenced the history of ceramics in Turkish. The gates had different shaped passageways through them and were flanked on either side by shallow water that reflected the colorful tiles. “There is no other architectural treatment that has remained as fresh, relevant and cool as ceramics has from a thousand years BC, right through into the 21st century,” said Furman. 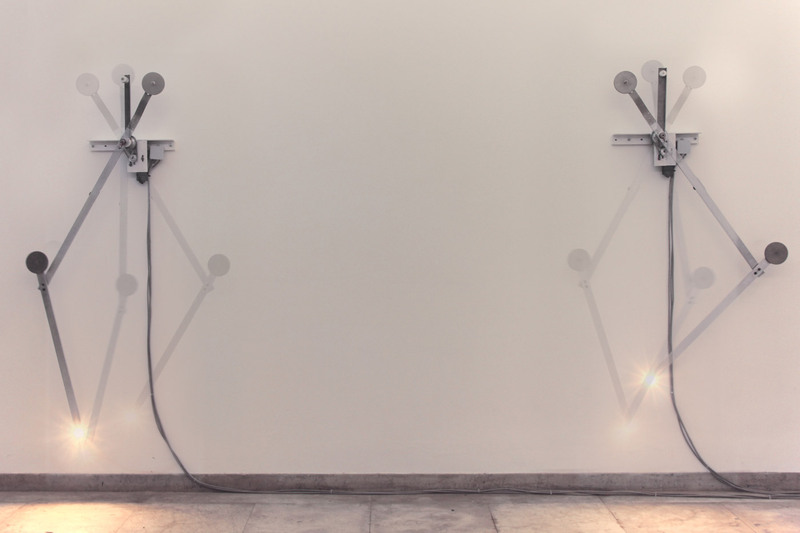 Also on show at the LDF was work from British architecture firm Sam Jacob Studio. Presented in collaboration with car manufacturer MINI, Urban Cabin was a mock micro-house situated in Blackfriars where Londoners could come and swap books. On one side of the cabin, Jacob installed classically-inflected entablature crafted with a range of materials including foam board, MDF and various types of other timber and chipboard. 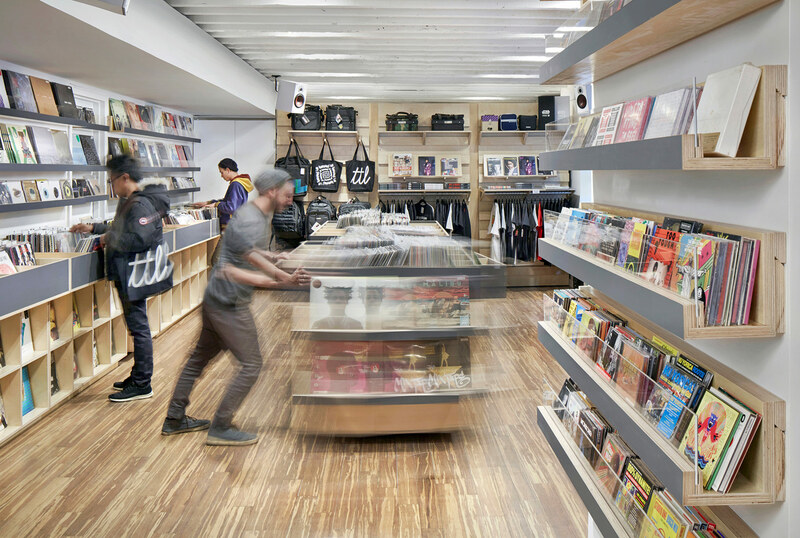 Among a hammock and other furnishings, Urban Cabin came pre-stocked with architecture, design and London-centric books for people to take and replace – on the condition that they left a personal note about the book. The festival continued at Somerset House. The most popular piece here was PriestmanGoode’s exhibition of interior design strategies for a hyperloop system. Here, visitors could also sit on prototype seat and feel test finishes and surfaces, look at color palettes and provide suggestions for what they wanted inside hyperloop cars. LDF spread to Greater London, too. In Bexley, East London, Erith Lighthouse was erected for the festival. The polycarbonate lighthouse, designed by architects DK-CM and design studio The Decorators, was erected along the Thames Estuary's edge and hosted a series of food-based events. Sticking to light as a medium, the Victoria & Albert Museum showcased the Reflection Room as part of the festival. Created by Flynn Talbot, the exhibition used 56 custom-made stretch membrane Barrisol panels to reflect orange and blue light which emanated from Tryka LED profiles installed at each end of an enclosed corridor . Want more? Find the full list of projects and events that were found at LDF this year here. Missed it? Maybe next year! The 2018 London Design Biennial will run from September 4 through September 24. "A hideous mess," "crass," "over-scaled," "[an] assault on all your senses from the moment you leave the Tube station." The judges were unsparing in their criticism of PLP Architecture's new London development, the Nova Victoria, which emerged the winner of the Carbuncle Cup, architecture's least wanted trophy. 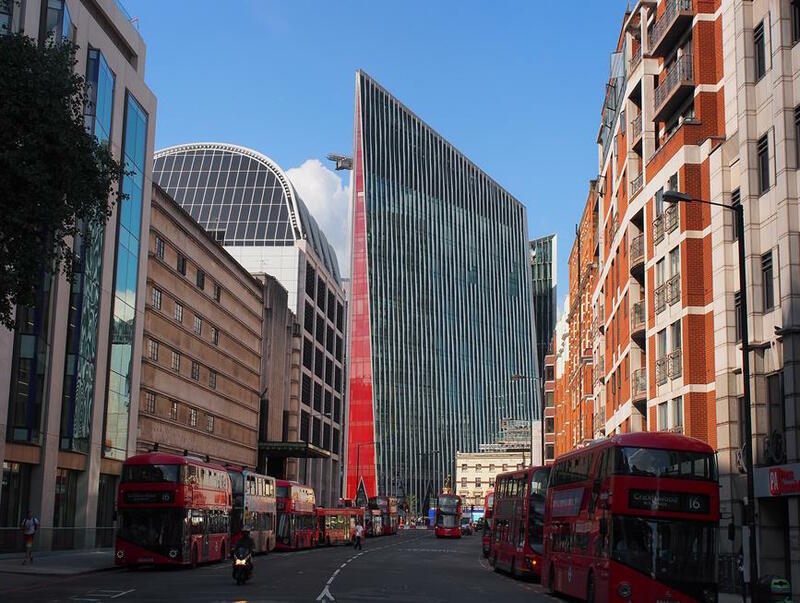 This is the sixth year in a row a London project has been crowned Carbuncle-of-the-year, annually awarded by Building Design (BD) a British architecture publication for the ugliest building to have been completed in the U.K. over the previous year. Among the six firms nominated for this year's Carbuncle Cup in the U.K., the largest studio, London-based PLP Architecture, walked away with the prize. Situated in the heart of London, PLP's Nova Victoria is one of the first set of structures people see when exiting Victoria Railway Station. And the sight that welcomes those unfortunate commuters, if they can see past the ongoing construction work, is a gargantuan up-turned arrowhead that is as red as the architects' faces might be today. Lee Polisano, president at PLP, told The Guardian that the building's color "is a reference to Victoria being an important transport interchange, so we chose a color that’s synonymous with transport in London." The developer behind Nova Victoria is Land Securities (LandSec) and this project is their second worthy of the Carbuncle Cup. Rafael Viñoly’s car-melting Walkie-Talkie building was the first in 2015. Nova, LandSec's most recent architectural clunker, houses offices, restaurants, and 170 apartments starting at $940,000. The $500 million project is described on its own website as "ultra-modern, beautifully engineered and architecturally daring. A statement for living amid the grandeur of Westminster and Belgravia." This apparent "statement," it seems, has not worn well on many critics. "Nova should have been good as it’s a prestige site. It makes me want to cringe physically," remarked judge Catherine Croft who is also director of the C20 Society in the U.K. The scathing didn't end there, either. Fellow judge David Rudlin lamented: "There’s no variety and you can’t read the floors." Speaking of the arrowhead, he added, "It’s got the same proportions as Salisbury Cathedral. For me the spire gives it carbuncular status–otherwise it’s just a bad building." BD editor Thomas Lane said also poured on the scorn. "The architect appears to have been inspired by the fractured, angular shapes beloved of stararchitects like Frank Gehry and Daniel Libeskind and applied these to a run-of-the-mill spec office development," he said. For all of Nova Victoria's flaws, it could have been worse. It's hard to imagine, but as The Guardian's Oliver Wainwright noted, three 40-story towers were proposed to Westminster Council in 2007. This was rejected, and rightfully so, for the project would have cast its Victorian surroundings in shadow. Worth noting too, is that views of and from Buckingham Palace would have been somewhat spoiled. The Architect’s Newspaper (AN) has partnered with urbanNext—a multidisciplinary platform for design promoted by Actar Publishers—to share articles on common topics every two weeks. This week, we’re pairing the urbanNext article below with AN’s “First look at Jenny Sabin Studio’s immersive MoMA/PS1 installation.” The article below was authored by Hans-Ulrich Obrist, an art curator, critic, and historian of art. … Those who signed their names on my copy of Metabolism 1960, Ekuan and I as chairman are the eight members of the group… For six years I have encouraged them to realize their proposals in the book so as to examine their validity. In my view, the flexibility that inherently exists in our society and the rapid economic growth in recent years should allow for their proposals to be realized. intimate group of architects, designers, and critics. One of the ways in which this was manifested was in the profound interdisciplinarity of Metabolism as it merged with other fields of knowledge. So, we have Tomatsu’s sociology, Kurokawa’s Institute of Social Engineering, Awazu’s graphic design, as well as an engagement with the broader spheres of science, technology, and biology. Metabolism, it could be said, belongs to the last heroic wave of architectural movements, in a period before the hastening of disciplinary specialization that we find with trends such as the otherwise exemplary Deconstructivist movement of Libeskind and Eisenman. Metabolism was anything but the manifestation of a recursive, architectural argument, but rather was profoundly open to the world, not least in its engagement with questions of environment and ecology. It therefore has many potential lessons for us today, as we search for ways in which design might lead us into the future. On the one hand, the challenges of sustainability, and therefore of urban wellbeing, demand that cultural production today reclaims its old sense of ambition and scale; that it once again embraces the possibilities of total design. Bruno Latour has recently called for an expanded role for design that extends "from the details of daily objects to cities, landscapes, nations, cultures, bodies, genes, and… to nature itself," welcoming this as a novel "political ecology" that might "ease modernism out of its historical dead end." This is not to say that we should resurrect anything like the monolithic aesthetic schemes of modernism itself, but rather that we should borrow from their ambition in order to form our own dynamic, shifting and alterable institutions and spaces of the future. Latour states that: "the little word 'design' could offer a very important touchstone for detecting where we are heading and how well modernism (and also postmodernism) has been faring." But one way of avoiding what is a potential pitfall of grand visions for the redesign and rebuilding of urban environments is to embrace possibilities for future change as an inherent facet of architectural and planning projects, in other words, to embrace impermanence and adaptability. It may not be too much of a stretch to imagine Metabolism as an object lesson in the way in which architecture might straddle these dual demands of the revisioning of the urban context and urban society, while at the same time accommodating uncertainty, becoming, and the changeable. 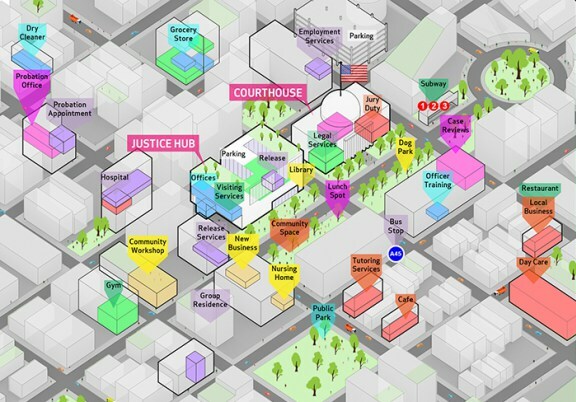 This article originally appeared as Architecture, Art and Metabolism on urbanNext. At a Tuesday meeting, the LPC voted unanimously to re-authorize a previously issued Certificate of Appropriateness to build out Pei Cobb Freed's vision and undertake preservation work on the interior. Plans call for retail and an apartment lobby to be built around the 1928 theater's landmarked ticket lobby and grand foyer (the rest of the interior was initially landmarked, but its protections were removed by the Board of Estimate after an appeal by an owner). Significant architectural elements will be conserved, while those too damaged for conservation or missing will be replicated offsite and reinstalled in the theater. Those changes, the LPC said, will be reviewed and permitted at staff level. Pei Cobb Freed is collaborating with New York–based historic preservation firm AYON STUDIO on the project. During the meeting, AYON founding principal Angel Ayón explained how steel trusses will span the landmarked interiors on the east-west and north-south axes to preserve the cavity as construction on the new building gets underway. When the architects have a new envelope, the team will be able to reinstall the plaster, woodwork, and new curtains. Ayón likened the work on the decorative features to the preservation of Times Square's Lyric Theater, which underwent a similar process to remove and conserve ornamental plaster. The LPC is working with the owner to make sure plaster gets put back in place. The two parties agreed to $10 million bond for storage and periodic inspection of the plaster, though the commission said those details still being hammered out. One major requirement of interior landmarks is that they remain open to the public. Patrick Waldo of preservation advocacy group Historic Districts Council (HDC), as well as Christabel Gough of the Society for the Architecture of the City, raised concerns about the accessibility of a space that fronts a future (private) apartment lobby. HDC "strongly" suggested the street entrance be re-examined to expose the interior more fully; at the very least, the group recommended strong wayfinding signage to alert the public to the presence of the landmark. To the knowledge of those in the room, there hasn't been another instance where an interior was preserved but the building around it demolished. Echoing others, Commissioner Frederick Bland summed up the situation as "very strange." With much of the theater's ornamentation slated for replication, “This is one of the strangest, if not the strangest, situation I’ve seen as a commissioner,” he said. “At what point is a landmark lost?" The recent history of the RKO Keith’s—once a mainstay of Flushing—has been dismal. Designed by Thomas Lamb—perhaps New York’s most prolific theater designer—it was planned originally as a vaudeville theater, with movies more or less an afterthought. Lamb designed it as a so-called “atmospheric” theater, attempting to create the illusion that the theater’s customers were seated outside, under the stars, in a picturesque Spanish village. The Spanish-inspired ornament ran throughout the theater into all its major spaces. Located at the major intersection of Main Street and Northern Boulevard, the Keith’s became a very visible institution in the neighborhood. By 1984, the Keith’s, still in use as a movie theater, was one of only three major “atmospheric” theaters surviving in New York City (the others being the Loew’s Paradise in the Bronx and the Valencia in Queens, both now official landmarks). The Landmarks Preservation Commission’s designation of the Keith’s entire interior that year was cut back at the Board of Estimate to include just the grand foyer—apparently because a politically connected developer wanted to include the site in a proposed new shopping mall. That plan evaporated, as did the plans of a subsequent developer, but the Keith’s remained shuttered; for 30 years it has sat vacant, decaying and crumbling, its interiors long since vandalized, even as other grand movie palaces have been lovingly restored. 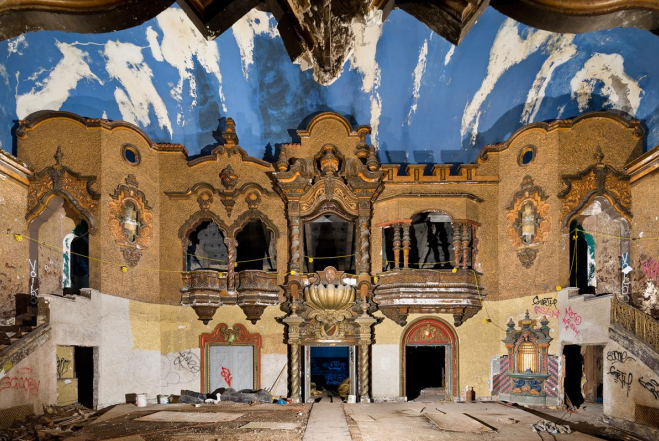 Now comes the ultimate indignity of the proposed demolition of the theater shell, and the grand foyer’s disassembly and reconstruction, all by itself, as an odd relic of a vanished theater from another era. There can be no happy ending for this story.